Tell us what you really think, why don’t you? 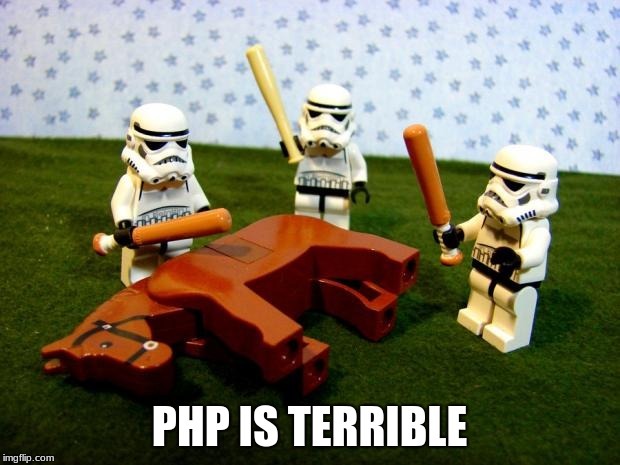 But don’t worry, these aren’t mere bitter cacophony or empty rant — these posts follow through and deliver all the myriad ways PHP fails, in-depth. But that’s not the fun part. Let’s look at one more. And that’s where we’re really at — even five years ago, beating on PHP was already a sad and tired endeavor, and yet we still can’t help ourselves to this day. “Dear Go — Thank You For Teaching Me PHP Was A Waste of My Time,” in all honesty, is more a sermon to the charismatic qualities of Golang than it is calculated takedown of PHP, but it still had to offer a swift kick on the way out the door. Keenan explains that he had used PHP long before the “classes and the other Object Oriented Programming capabilities that has given PHP more life lately” came around. Now, however, Go has swiftly taken its place and he’s not looking back — well, just a little. Keenan also points to the rise of serverless as another reason to pay attention to Go, noting that Amazon even brought the Google-backed language to its AWS Lambda serverless platform before Google could offer a similar capability in Google Cloud Platform. The time to switch, he writes, has come. And with that, we end with a little tutorial on using Go in Google Cloud, a feature just released last week. Peeking Inside GoLang Apps with Dynatrace: Sticking briefly with Go, Dynatrace announced this week its automatic code level insights into Go applications including Cloud Foundry, Kubernetes and OpenShift core components. “There is no need to inject code into thousands of microservices or change the code of a Go application, instead Dynatrace automatically discovers and monitors Go components,” the company explains in its announcement. NumPy’s Last Python 2.7 Compatible Release: Speaking of hating on languages, there’s some distaste out there for old Python and NumPy 1.16 is the last release to support Python 2.7, to which many people cheered. According to the release notes, this release “is the last one to support Python 2.7 and will be maintained as a long term release with bug fixes until 2020. Support for Python 3.4 been dropped, the supported Python versions are 2.7 and 3.5-3.7.” For those of you keeping track, you can always check out the Python Clock to find out just how long you have to wait for Python 2.7 to die already. GitHub’s State of Machine Learning: For you machine learning aficionados out there, GitHub has released another blog post in its “State of the Octoverse” series, this time focusing on machine learning. The post dives into stats like top languages and frameworks, and explores some contributor stats for projects like Tensorflow and scikit-learn themselves. No surprise, Python leads the pack (though R comes in at the ninth spot this year) and numpy is still the most popular data science package. TSA agent: *sees stickers on laptop* "ok put everything in it's own container so it's easy to handle just like in the cloud ok?" Me: was … was that a docker joke? Explaining Istio: Changing gears a bit, this post from InfoWorld is a great explainer for those of you wondering what this Istio thing is that everyone seems to be talking about lately. “Microservice architectures solve some problems but introduce others. Dividing applications into independent services simplifies development, updates, and scaling. At the same time, it gives you many more moving parts to connect and secure. Managing all of the network services — load balancing, traffic management, authentication and authorization, etc. — can become stupendously complex,” the article begins. “There is a collective term for this networked space between the services in your Kubernetes cluster: a service mesh. A Google project, Istio, is all about giving you a way to manage your cluster’s service mesh before it turns into a bramble-snarl.” The rest is worth a read as well, but if nothing else, well, there you have it. And Then There’s Infrastructure-As-Code: Another topic you may hear discussed a lot, but have never really dived into — Infrastructure-As-Code — gets a proper treatment from the Crate.io blog, which this week released part three of a series that explains it from the bottom up. Parts one, two, and three take readers quickly from concept to practice, and I found the whole thing rather informative. "Cannot read property b of undefined"